Motorola Mobility, an unit of Google has launched two new mid-range smartphones and a smartwatch for Indian markets. Both smartphones are remarkable and Google hopes to make dent in Indian mobility markets. The smartwatch market is yet to take off in India so it may be interesting to the sales figures for Moto 360. 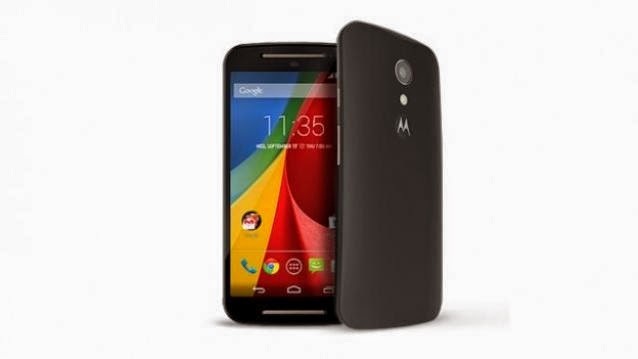 Motorola Mobility's Moto X second generation is a carry over from the Moto X earlier with changes in specs. MotoX 2nd Gen will have 5.2-inch with 1080p while the older version supported on 730p screen. In addition Moto X 2nd gen will also have Corning Gorilla Glass to protect your device from scratches and it will come with full HD screen. Moto X 2nd Gen will come in two back panel varieties, a black leather-feel panel and a wood panel. Now this is a first one for smartphones as according to Motorola, the back has actual leather on it and this may be nice innovation. Running the Moto X 2nd gen will be a 2.5GHz Snapdragon 801 up from the previous 1.7 GHz processor coupled with 2GB RAM. The smartphone will be available in 16GB and 32GB internal memory variety and has no external memory support. It will run on a 2300 mAh unit and will support Turbo charging which will help users in charging in case of extreme emergency. Motorola Moto X says that the battery will last a full day on on cylinders. Even in the camera department the Moto X has been given a upgrade over its predecessor. The new Moto X ships with a 13MP rear camera over the earlier 10MP one, and has a 2MP front shooter. Motorola has fitted a DUAL-LED ring flash which it says will sure that the pictures dont have the tinge of harshness when you normally shoot with a flash. The camera also supports Ultra HD 4K video recording which another feather in Moto X 2nd gen cap. It will also have a assortment of Apps for letting you get the most out of the camera. Moto X will run on Google's latest Android Kitkat 4.4.3 version and buying a Google developed smartphone assures users of getting the subsequent upgrades and releases of Android such as Android L before any other smartphone. All in all, at Rs.23999.00 except for the external memory part this one is a steal and if you are ready to wait for another six months it may be available at 20K. Motorola and Google may have hit the nail right on the head with this smartphone in the range highly dominated by Indian smartphone manufacturers like Micromax, Xolo, Karbonn etc. This smartphone with its superior specs and really smart pricing and Google + Motorola goodwill advantage is sure to be big hit in India markets. Available in India for Rs.12999.00 this Dual-SIM smartphone will sport a 5-inch screen up from previous 4.5-inch screen avatar. Sadly the screen resolution has been kept the same at 720p which will give a pixel resolution of 294 ppi. The fact that Motorola hasn’t gone for a full HD screen which is a bit disappointing given the threat from likes of Xiaomi’s Mi 3 which offers a full HD screen. Moto G 2nd Gen will have a scratch resistant Gorilla Glass. Moto G 2nd Gen will ship with the same Qualcomm Snapdragon 400 system-on-chip (SoC) with 1.2GHz quad-core processor as its predecessor. Moto G 2nd Gen has 1GB RAM and 16GB internal storage space. It will also support a microSD slot with 32GB as the limit which is perhaps first time Moto is offering the expandable memory slot. This along with the fact that Motorola has increased the the internal memory 8GB makes Moto G 2nd Gen, a sureshot winner in the 12k to 15k segment. For photography and selfie enthusiasts, Motorola has bumped up the Moto G camera from 5 megapixels to 8 megapixels and the front shooter from 1.3MP to 2MP. In addition the rear camera also have a flash. The Moto G also has two stereo speakers on the front for better sound. Just like Moto X 2nd Gen above, the Moto G 2nd Gen will also ship with latest Android Kitkat 4.4.3 version. Similarly being a smartphone from Google stable it will be one the first ones to enjoy the latest upgrades and the all new Android L operating system when release. Again at Rs.12999.00 this smartphone is a steal on all fronts except the resolution part. Google has also announced the launch of its new Android Wear run smartwatch called Moto 360. Thought the release dates are not yet confirmed, the price has been set at $249.99 (Rs.15000.00) in world markets which means that the smartwatch will be available in 15K to 20K range to Indian buyers. Moto 360 smartwatch will come in default black or limited edition gray leather strap but Motorola will be offering the metal strap in future as well with additional price of $79.00 (Rs.4750.00). Leather straps, meanwhile, will cost $29.99 (Rs.1800.00) by themselves. The beauty of Moto 360 is that it is so lightweight that you almost forget you are wearing the contraption on your wrist and its thin. At At 11.5mm, it may be a little thicker than the standard wristwatch but hey you are using a smart device. Moto 360 will have a 1.56-inch backlit display and comes with a 320 x 290 resolution which comes to 205ppi. Unlike most smartwatches we have seen so far, the Moto 360 has the 'almost' circular display. It will also have a layer of Corning Gorilla Glass 3. It is made of a stainless steel. It is powered by the TI OMAP 3 processor and will run on 512MB RAM. It will also have 4GB internal memory which should be sufficient considering that this is a smartwatch. For tracking activities, it is fitted with a pedometer and optical heart rate monitor (PPG). The IP67-certified Moto 360 is water-resistant and also supports wireless charging. You can connect Moto 360 with any Android device running on Android 4.3 and up using Bluetooth. Having a smartwatch changes the usage algorithm a little bit compared to a smartphone. Smartphones are mostly used fitness, listening music on smartphones and getting realtime notifications from your smartphone. Moto 360 which runs on Android Wear offers most of these features. It gives you the ability to play music on the smartphone, get notifications, reply to text messages or notifications, pedometer, travel alerts etc. Moto 360 will also have Google Now giving you notifications even before you ask for them based on your location, time and usage pattern which is neat. The software part covers a lot of Apps which can show the heart beat, calories burnt, take notes on the phone via Google Now, etc. Motorola says the 360 is equipped with a battery to last a full day but that is tad low and bit doubtful considering tha Moto 360 will be connected to your smartphone through out the day via the Bluetooth LE connectivity. No doubt, Moto 360 is a feature rich smartwatch but the smartwatch market is yet to take off unlike the mobility one. This is true for the world as well as India where except for nerds no one really uses smartwatches. So, as pointed above, only sales figures released by Motorola in future can tell us about the real utility and popularity of Moto 360. However all things said and done, Moto 360 is the only smartwatch to come near to a standard wrist watch in terms of either the size of or the circular feature. And given that the mobilty is stagnating spec wise, the smartphone manufacturers hope the that smartwatch will be the next 'in' thing in 2015. Users are eagerly awaiting the iWatch which will support NFC and should be launched by end of this year. Indians can expect Moto 360 to be available by Diwali this year. Moto G 2nd Gen is a steal at this price so if you are planning on buying a smartphone this holiday season, give Moto G 2nd Gen a try.